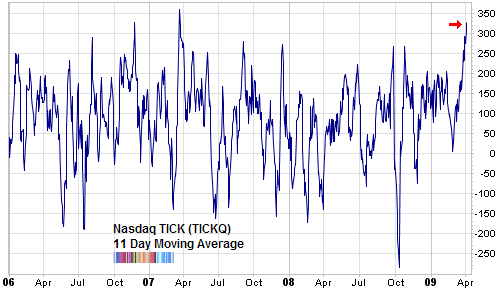 I prefer to use the Nasdaq TICK data because the NYSE’s is influenced by too much noise as a result of the non-operating company listings. Clearly, we are in thin air territory here. A simple moving average of TICK serves as a crude approximation of the cumulative TICK measure made famous by market wizard, Mark D. Cook. But unlike previous times shown on the chart, there are only 13.6% of the S&P 500 constituents trading above their simple 200 day moving average. That is up from the recent low of 1% in early March. But still extremely low. This demonstrates just how washed-out stock prices were in general. Finally, the Nasdaq Summation Index, shown in this long term chart below, is now back to levels we previously saw in October 2007 - when the market topped out. Also, the zero line (shown in yellow) seems to have also acted as a barrier. 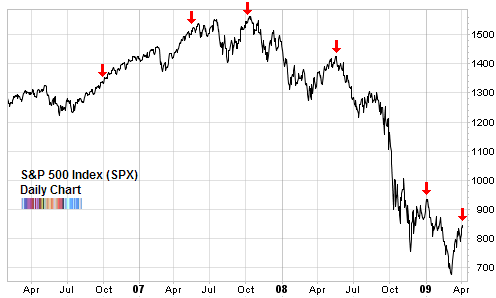 With the exception of extraordinarily powerful rallies like the one coming out of the 2002-2003 bear market. The S&P 500 Index (SPX) closed today at 835.48, basically where it stood on March 26th, 2009 (832.98) when I pointed out that the McClellan Oscillator was hinting at a short term top. 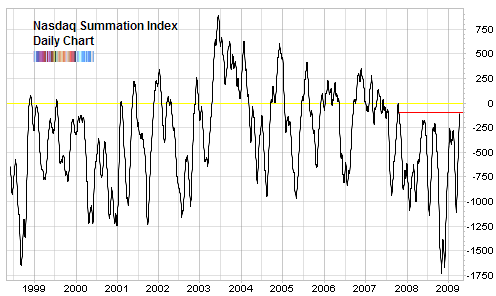 The McClellan Oscillator and the Summation Index are closely related. Compared to previous times, the only difference is that the market hasn’t rolled over almost immediately. Which brings us to the key question now: how will the market resolve the overbought state that it finds itself in? will it continue to tread sideways? or retrace? If it were to retrace as even those that foresaw the rally expect it to, then it would have yet to show a higher high, and a higher low. As you know, that’s the basic definition of an uptrend. So, despite a herculean rally of +20%, technically, equities would still be in a downtrend. 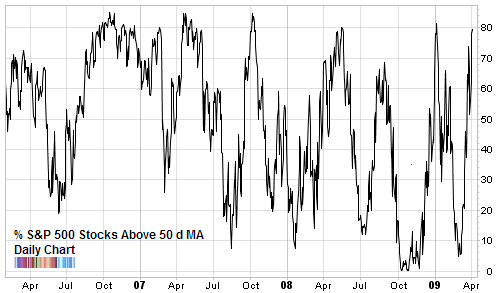 Sure, bullish stock market sentiment has jumped higher. Although it would a gift from the contrarian God’s if it hadn’t, that is to be somewhat expected and even necessary if the rally is to endure. That is, people need to stop being afraid and to buy to push prices higher. So for the time being, the thesis I’m following is the one I outlined a few days ago by doing a “Weinstein” stage analysis.